The Scoop: Over the last 30 years, Dr. Terri Orbuch has developed science-based strategies for strengthening and maintaining personal relationships. Since 1986, she has been following 373 married couples and observing them as they make a life together, raisedchildren, and, in some cases, get a divorce. She became “The Love Doctor” because she wanted to share the findings of her research with the general public. She has written six books and thousands of motivational articles on the subject of love and hopes to continue inspiring singles and couples for generations to come. Recently, Dr. Terri has also launched a dating coach training program to pass on her successful methods to matchmakers, coaches, and other professionals. Dr. Terri Orbuch has taken a threefold approach to dating coaching. She told us she wants to share her insights with three distinct markets: singles and couples, dating coaches, and parents. Her goal is to teach people how to find and keep love, and she is constantly thinking up new ways to send her message where it will do the most good. Dr. Terri Orbuch has over 30 years of experience studying relationships and coaching couples. Dr. Terri offers dating coaching and business coaching on her website where she brands herself as The Love Doctor®. 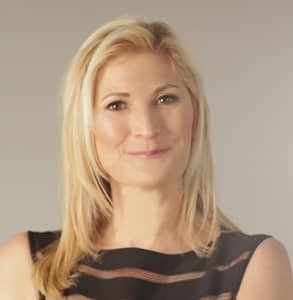 Her business coaching targets other academics who want to translate their research on relationships for the general public and generate media attention around their studies or findings. Dr. Terri is also the official Dating and Relationship Expert for a Jewish matchmaker firm called Simantov International. As part of her job, she provides dating and relationship advice to Jewish singles seeking long-term love. Throughout her career, Dr. Terri has published six self-help books and thousands of advice articles on dating issues that cut close to the heart. She tackles weighty subjects in an approachable and practical manner that encourages readers to learn, heal, and grow. 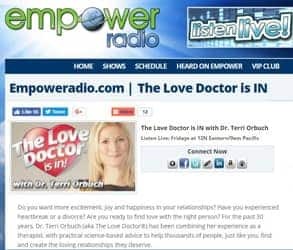 In addition to her one-on-one coaching, Dr. Terri coaches a broader audience on a popular radio program on Empower Radio Channel. “The Love Doctor Is IN” streams live every Friday at noon EST. After the show airs live, Dr. Terri archives the episode online so anyone can listen to her advice. “I share my relationship advice, inspirational stories, and thought-provoking guests,” she said. Dr. Terri answers common dating questions during her live radio show. In 2018, Dr. Terri said she plans to highlight relationship and dating experts as guests on her radio show. She said she hopes her conversations with these experts can help her listeners improve their love lives and dating experiences. Whether she’s providing tips in print or on the air, Dr. Terri makes a point to stay upbeat, provide useful information or statistics, and get to the heart of relationship troubles. Her guidance has inspired many people to make positive changes in their personal lives. The Love Doctor also keeps singles and couples in the know through her monthly newsletter, a free resource that highlights her findings and insights into love and relationships. Each month, Dr. Terri offers her followers inspiration and guidance by compiling dating advice articles, self-help resources, and fun relationship quotes. This newsletter encourages people to stay engaged with her website and use her programs to further their education on what makes relationships succeed. Dr. Terri earned her PhD in social psychology and has conducted extensive research on what makes married couples stay together or break apart. Her 30-year study on 373 married couples in the US has given her tremendous insight into the inner workings of relationships, and she endeavors to make her knowledge accessible to as many people as she can. She recently started a Science-Based Coaching Certification Course to train other professionals in the industry on her practical approach to dating coaching. Dr. Terri works with matchmakers, dating coaches, and other relationship coaches on ways they can engage clients and provide results-oriented advice. The 12-week online course is an instructive guide for movers and shakers in the dating industry. Each module includes up to 50 minutes of lecture materials, homework, quizzes, and additional resources. She outlines the fundamentals of her approach in the online lesson and then provides an in-depth overview via a weekly live call. Dr. Terri is also available to answer questions on a private Facebook group for the class. She also conducts one-on-one calls with each student to ensure they understand the lesson. Over the years, Dr. Terri has written books about what makes a good marriage and how to find love, and she has provided extensive research findings to back up her advice. Now she’s turning her attention from the world of dating to the world of parenting. She is currently writing a self-help book for parents who want to help their children establish healthy relationships. The book, titled “Good Relationships for Your Children Start With You,” will offer science-based information on setting a good, loving example at home so children grow up emotionally balanced and equipped to find love themselves. The Love Doctor made a name for herself by applying scientific research to the dating world. Dr. Terri’s new book will give parents the information they need to pass on healthy relationship-building skills to their children. Its informative chapters and exercises will equip readers to raise well-adjusted children. Anyone suffering from a broken heart can turn to The Love Doctor for a proven remedy. Dr. Terri offers practical tips to readers, clients, and listeners who want to improve their relationships and themselves. Her dating and relationship advice isn’t based on gut instinct or anecdotal evidence but careful academic studies on hundreds of married couples and divorced singles. Her science-based approach to dating coaching makes her stand out to singles and couples in search of clarity in their love lives. She has recently expanded to train other professionals in her results-oriented coaching so she can have a greater impact on the dating arena. Dr. Terri’s website is full of resources for singles, couples, parents, and professionals who want to understand how to give and receive love in healthy relationships.